For those of you who don’t know, Target puts out a beauty bx once or twice a month. This box is from mid-November. These boxes are a great value at either $5 or $10 and sell out quickly. This is the third one I have purchased and I love them. This box is an excellent value at $10 and I more than got my money’s worth. I will describe the items going from bottom row to top row and left to right. S.W. Basics Certified Organic Body Scrub – gentle exfoliation and deep hydration made from 3 simple ingredients: sugar, coconut oil & shredded coconut. I have not tried this yet. It looks like it is only enough in the sample for one use. Covergirl Intensify Me Eyeliner 300 – intense black formula glides on smoothly and dries quickly for instant drama. I have not tried this item yet either but am excited about trying it. I am currently using a liquid eyeliner that goes on with a brush and I want to try the pen type to see if it applies easier. As soon as I finish what I’m using now I will try this. Goody Ouchless Silicone Lined Elastics – made without metal for reduced snags and pulls. I pull my hair back with an elastic band when I wash my face. I sleep with it like that too because I don’t like my hair in my face. I will certainly use these. Olly Beauty Vitamins – an expert blend of antioxidants, vitamins, minerals and collagen that promotes healthy eyes, skin & hair. I will take these but do not foresee ever purchasing them. I’m not much on taking vitamins daily. Acure Moroccan Argan Oil + Stem Cell Triple Repair Shampoo & Conditioner – organic argan oil provides moisture for even the most damaged hair, leaving it soft and manageable. I will definitely use these too. I enjoy trying new shampoos and conditioners. I will probably wait until colder weather when my hair will benefit from a more hydrating shampoo and conditioner. I am currently using a face scrub by Acure that I got in my October Ipsy bag. I like it and look forward to trying these products from that company. Hello Toothpaste – dye-free, sugar-free paste safely polishes teeth and freshens breath. I have not tried this yet because I have sensitive teeth and use toothpaste formulated fr that. I do like to have sample sized toothpaste for when I travel. This will probably go in my travel bag. Revlon ColorStay Ultimate Suede Lipstick – velvety soft formula moisturizes with shea butter and aloe for color that lasts, available in 20 shades.This was full size. 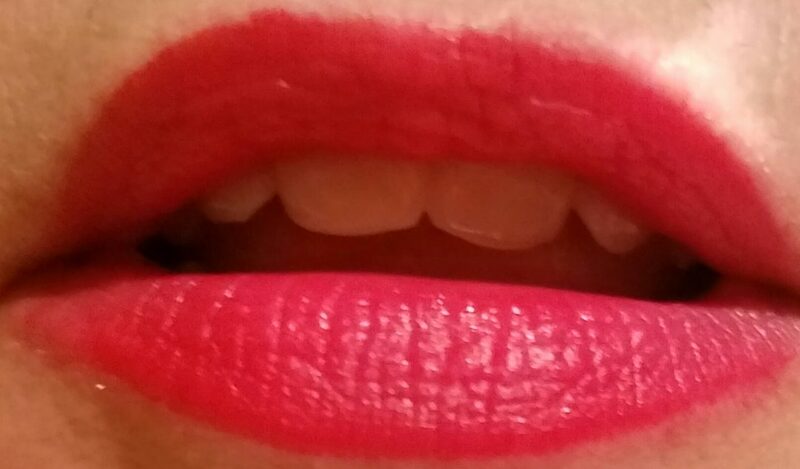 I wore this lipstick this week. It goes on creamy and smooth with good pigmentation. Mine is in the the shade Muse and it is a bright, rosy pink shade. It dried quickly to a nice matte finish that did not transfer easily. It did not leave lipstick all over my glass. I initially applied it around 6:30 a.m. and it was still looking good at lunch time. I reapplied after lunch and it lasted the rest of the day. I like the formula of this lipstick but the color is not the best for me. I may buy this lipstick but I would get a different color. Skinfix Ultra Rich Body Butter – super-rich formula quenches dry, parched skin. I have not tried it yet. My skin is in good condition right now but I will try this in the winter. I love body butters and am sure I will like it. RoC Deep Wrinkle Night Cream – lightweight, retinol treatment hydrates skin cells and helps reduces the appearance of expression lines and deep wrinkles. This is a full size product and retails for around $18 at Target. This item alone makes the box more than worth the money. I have wanted to try RoC products for a while now but have not. I am at the age where I need a retinol product. I will try this as soon as I finish the Clinique Turnaround Cream Nighttime Moisturizer I am using. It is about half full. I will write a full review on it after I have used it enough to form an opinion. This beauty box was an awesome value. The two full sized products sell for almost $26 at Target. This box gives you an opportunity to try different products for a great price. They offer a variety of products like hair care, skin care, makeup, and body care.